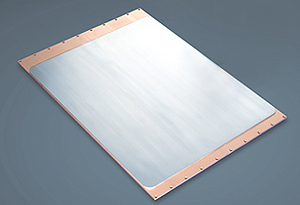 We can offer the sputtering targets for interconnections and reflectors in liquid crystal displays. Our Al sputtering targets haved been widely used by many customers for Gate, Source/Drain interconnection. We also have a manufacturing ability to make Cu/Cu alloy, Ti sputtering for LTPS. 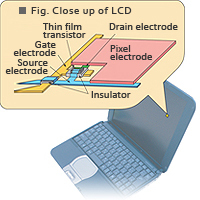 Liquid crystal displays (LCDs) are used for notebook and desktop computers, cellular phones, and flat televisions. The display consists of millions of red, blue, and green pixels, and the intensity of light for each pixel is controlled by a thin film transistor associated with it. To activate each transistor, metal interconnections made of pure Al or Al-arroy are used. For some cellular phones, Al-alloy films are incorp0orated in the LCDs to reflect the light from outside, reducing the power consumption. To make the interconnections and the reflectors of submicron thickness films, sputtering techniques for metal evaporation are widely used to spray atomic elements from a sputtering target.